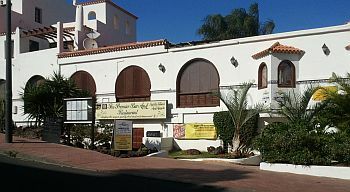 This bar/restaurant has been established on Amarilla Golf since 1999 and has had the same husband and wife team running it since then. Alan and Carole have, in May 2011, undertaken a complete refurbishment of their venue, making it even more stylish than ever. Far from being just a bar, the venue prides itself on its fine restaurant food, which is served right through the day from 10am till 10pm. There are two chefs in the kitchen, one of whom has been turning out excellent food at the Premier for four years. The meals are rated pretty much unanimously by customers posting on forums as excellent, both in quality and value. Add to this the warm and friendly welcome you receive, whether you're a regular or it's your first time, you can't go wrong! But, the Premier Bar isn't just a restaurant - it's a major entertainment venue, too. Apart from the fact that Alan's other half, Carole, can get on stage and belt out a song with the best of them, the venue features a full entertainment package. At around 9pm, things kick off, when the resident compere hosts a session of karaoke. At around 11pm, the guest cabaret steps into the spotlight. You can rest assured that you'll see some of Tenerife's finest performers. Thereafter, karaoke resumes and, together with a video disco, takes proceedings through to closing time, at 2am. The venue also features a bingo and quiz night every Monday and is also fond of arranging fancy dress nights, for such occasions as hallowe'en. A nice, welcoming family-friendly bar/restaurant, suitable for all age groups. You'll now be on a long, winding road taking you into Amarilla Golf. Stick to this road for a good while and, eventually, you'll come to a roundabout. Take the first exit. This road will then take you to Fairways Club, on your right and the Premier Bar is part of this building. The entrance is from the street running along the complex.